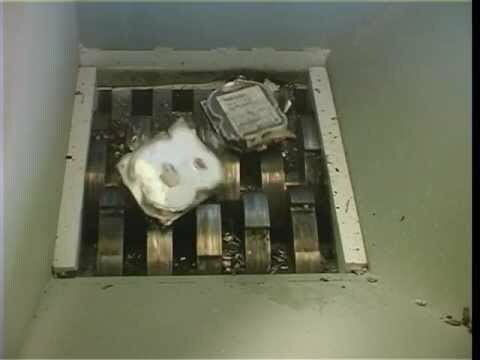 The JBF 38-50HD Mobile Hard Drive Shredder has been especially designed for use on Trucks and Trailers to completely destroy Hard Drives and Discs and other media initially to 30mm pieces, and then continue to grind down to as small as 6mm particles meeting the most stringent requirements for Secret and Top Secret Destruction. The JBF 38-50HD is a flexible Shredder/Disintegrator with various options for feeding and exiting of all types of Media Products. It is designed for high throughput with a cutting zone of approx. 380 x 500 mm. The hard wearing knives continuously cut drives until they are small enough to fall through a hardened granulation screen of a defined size for absolute security destruction. The Shredding unit consists of a robust steel support frame, designed to accept a standard 117 litre wheelie bin with optional conveyor feed and exit available. Two slow revolving shafts offer low-noise and low wear, this low RPM eliminates the risk of spontaneous combustion.